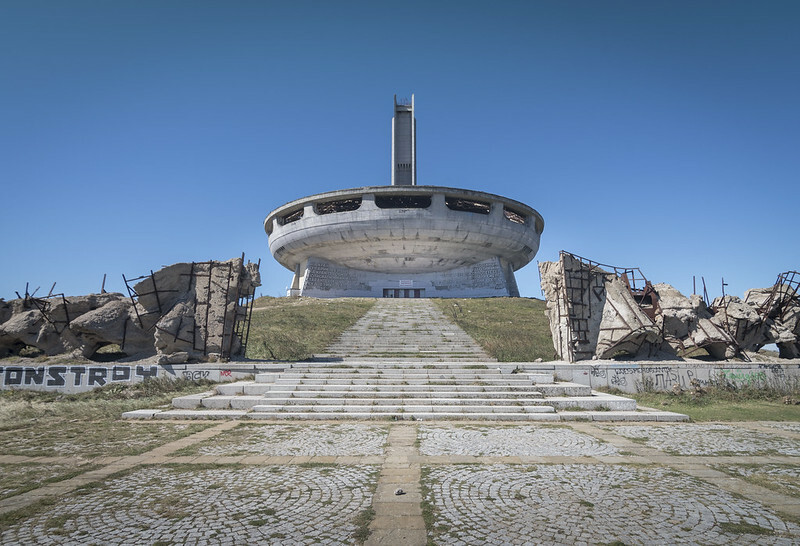 Europa Nostra, the leading heritage organisation in Europe, and the European Investment Bank Institute published today a technical and financial report comprising an action plan to preserve and develop the Buzludzha Monument in Bulgaria. 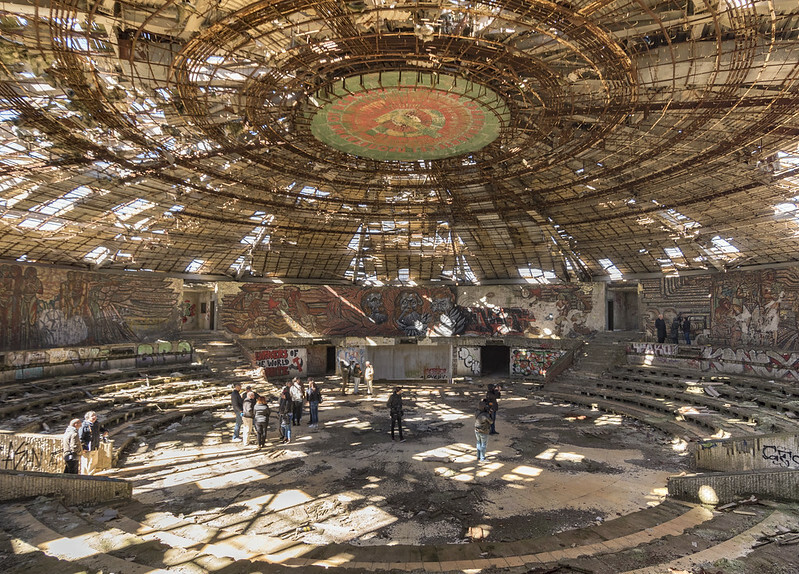 The building was listed among the 7 Most Endangered heritage sites in Europe in 2018, following a nomination made by the Buzludzha Project Foundation. The report was formulated on the basis of the outcomes of the three-day expert mission in Bulgaria undertaken from 26-28 September 2018. During the mission a delegation of European specialists in cultural heritage and finance visited the Buzludzha Monument and met with representatives from the Council of Ministers, the Ministry of Culture and the Regional Administration of Stara Zagora. According to the experts, “the Buzludzha Monument is a unique engineering achievement” and “a masterpiece of architecture and crafts, with evident European interest due to its historic significance, its peculiar characteristics and its numerous potential future uses”. The Monument is currently abandoned to decay. “The primary purpose of this action plan is the recovery of the Monument, firstly to return it to a safe and usable condition, and then to bring it into a new life, offering the possibility of organising cultural/touristic visits and many other types of events (e.g. seminars, concerts, exhibitions). The basic intention is not to restore it completely back to its original status but to adapt it to new attractive uses. Notwithstanding, it has to be noted that a crucial target of this action plan is to keep the Monument out of future political controversies,” states the report. The Monument is state-owned and currently managed by the Regional Administration of Stara Zagora. The Bulgarian Council of Ministers must transfer the ownership of the Monument to the public administration, including the responsibility of implementing the project and managing it in the future. This is most likely to be the Ministry of Culture or, alternatively, the Regional Administration of Stara Zagora or the Municipality of Kazanlak. Private ownership or concession is highly not recommendable as it would result in no direct control over the future use and content of the Monument. Nevertheless, private management of the Monument during the operational phase is to be considered. In parallel, the Buzludzha Monument must be designated as a Cultural Heritage Monument of National Interest protected by Bulgarian law. An immediate Emergency Action should be planned and implemented to protect the building from further deterioration and prepare it to safely receive visitors. As a minimum requirement, the building should be made weather-proof to ensure no water penetration through the roof or the windows to avoid further damage. Basic repair activities include cleaning the interior and managing waste, demolition of elements at risk, urgent mosaic repairs, installation of windows and covering the roof. This Emergency Action could probably be undertaken and funded by the Bulgarian Government under an emergency initiative. A pre-condition is carrying out a technical assessment to evaluate the current status of the building, and defining the best solutions for its minimum conservation. The cost of this urgent action is estimated at roughly 500,000 euros plus taxes. A detailed Feasibility Study must be conducted to fully evaluate the building’s current condition, conservation needs and priorities. The study would consist of the development of a definitive design concept for the future use of the Monument, allowing it to be shaped through public discussion. As a basic starting point, the study could consider the design proposal made by the Buzludzha Project Foundation – which puts forward a creative, interactive and innovative reuse of the Monument. Furthermore, the study must include architectural scanning, technical studies, a business plan, risk analysis, a project implementation plan and environmental impact assessment. In general, there should be a pragmatic approach, maintaining the spirit of the original concept while allowing modernisation to current standards and expectations. The main symbolic communist elements (e.g. the stars, the sculpted text on the main façade, the central hall ceiling medallion and the mosaics) should be retained for their architectural/artistic/craft value, but not enhanced. The presentation, story and interpretation of the Monument should make clear that such design details are not retained to promote the former socialist period but to set it within the broader context of the Bulgarian history over the last two centuries. Finally, a glass elevator could be added to allow visitors to explore the spectacular views across the Balkan range from an open deck at the top of the tower. The project has a preliminary estimated cost (including emergency action) of 7.5 million euros plus taxes. This cost estimate has been prepared with the assumption that the concrete structure and elements are not suffering from any unusual difficulties. The rehabilitation project would generate employment for some 600 people per year. (Local unitary costs may considerably vary, so these estimates must be reviewed in depth and updated in the feasibility study.) In total, a period between 4 and 5 years would be reasonably necessary to complete the works. The main economic (intangible) benefits are basically related to the generation of employment (both during construction and during operation), environmental benefits, tourism attraction to the region and creation of indirect new business, and visibility of the importance of the Monument and its surrounding environment. The tangible benefits the project would generate are revenues from tariffs paid by visitors, incomes generated by the organisation of special events, revenues produced by other directly related activities (e.g. expositions, merchandising), and subsidies and grants. It is foreseen that the project would be eligible under the regulations of one of the European Structural Funds, most likely the European Regional Development Fund or the Cohesion Fund. Eligibility criteria would be justified as contributing to regional development, cultural tourism promotion, environmental protection and rural development in deprived areas. If Bulgarian authorities are interested in managing and completing the funding of the project, the EIB-JASPERS facility could provide technical support (free of charge) for the preparation of the application form. Furthermore, if the Ministry of Culture takes responsibility of the Monument, a much more ambitious project for the entire National Park Museum Shipka-Buzludzha could be developed and implemented with European Funds. In addition to the preservation of the monuments and the nature of the park, the project could include an integral fire prevention system, new tourism infrastructure and the inclusion/promotion of the park as part of international cultural routes. The preservation of Buzludzha Monument would mark the “revitalisation of an iconic landmark immersed in a singular environment, and offering great future opportunities from cultural, touristic and socio-economic perspectives.” Moreover, “the project could become an example for other currently neglected artefacts from the socialist period, both in Bulgaria and in Eastern Europe, and might open the door for reassessing other heritage sites in terms of education, conservation and reuse,” concludes the report.